SnapCacklePop: Get ready for StooShe..! After much dominance in the charts over the last few years of solo pop singers, we are seeing a change as pop groups are returning..! At SCP we love a pop group..! Think S Club 7, Blue and of course The Spice Girls.They can be fun, cheeky, cheesy and full of personality, which is exactly what Stooshe offer..! This three-piece UK girl-group bring a combination of R&B, pop and hip hop, oozing fun, catchy lyrics and phat beats that you just can’t help but love. 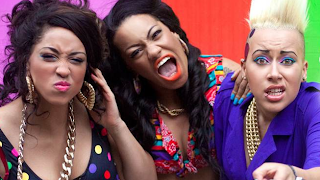 Their first official single, Love Me featuring US rapper Travie McCoy debuted at number five on the UK Singles Chart and we are predicting to see a lot of these girls in 2012. Check it Love Me below.